As my marathon date gets closer and closer, I’ve been running less and less. But in a good way, I think. 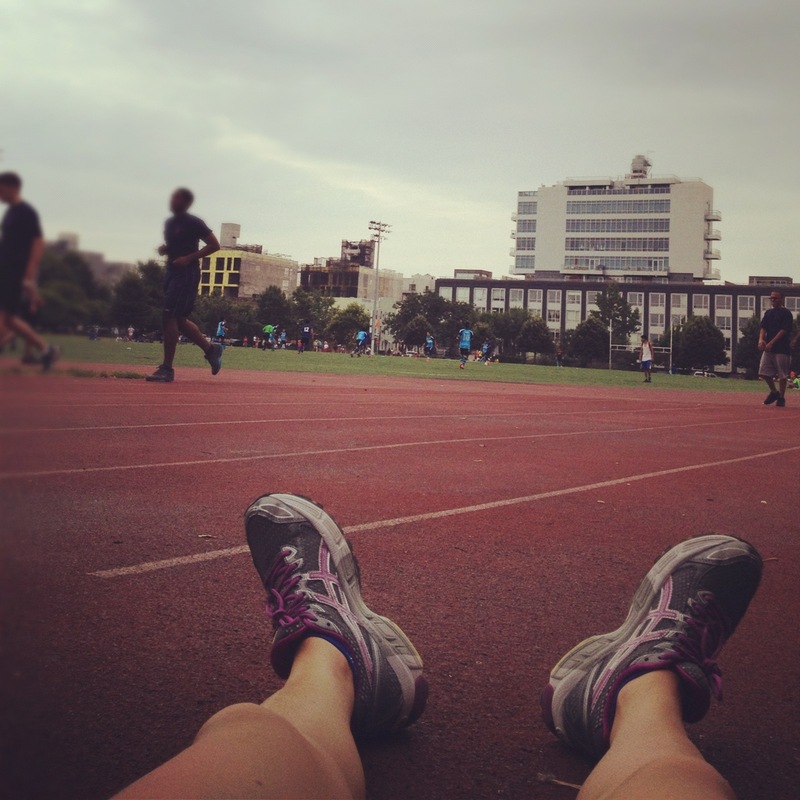 I’ve only dabbled with distance running since the winter, and quickly fell in love with running long. I started running with music for the first time, and became addicted to going for miles on end while listening to some of my favorite tunes. Yet recently, something’s changed. I hit the track a few months back to do a speed workout, and realized that I lost all my speed from high school. At one point in time I could run 400 meters in 59 seconds, and now I can barely do it in 70. 200m repeats in 35 seconds were no big deal, and now I’m breathing heavy just hitting under 40. At the same time, I started getting annoyed by my armband, by R Kelly singing his remix to ignition in my ear, by running for over an hour around the same park with the same hills with the same thick air and sirens. So I went back to the track. Lately I’ve been doing a lot of track workouts, from 200 meter cut-downs, to mile repeats, Yasso 800’s, and 100 meter sprints. I’ve also been going back to fartleks and tempo runs, circuits and supersets, yoga and lifting. Pretty much anything but distance running, the thing I should prooobably focus on since my marathon is less than 10 weeks away. Or maybe not. A few weeks ago, Greatist headed over to CrossFit’s NYCEndurance, a running program with a motto “Intensity is Everything,” and a model that’s basically “run shorter, run faster” in order to see better fitness results, including endurance. Even when training for a marathon, they have their runners maxing out at 20 miles a week, with their longest run a mere 13 miles. And while I’m not exactly sure most people would want to go into a marathon knowing they’ve only completed half the distance (so much of it is mental! ), I see NYC Endurance’s point. I remember my first 20-mile run, which doubled the farthest distance I had run prior. I credited my strength training and speed for keeping me alive for miles 15-20, but was also pretty positive if I ran one more step, I’d fall apart. So with my first marathon creeping up ever so quickly, I’m beginning to wonder if I should switch up my training plans, or stick to what I’m doing: fast, hard, and home. Can I keep winging it, sneak in a few 18-20 runs in, and call it a day? Or should I do some serious remodeling on my training calendar?? Help.